A couple of weeks ago, Elaine was having coffee with her friend Jules. Jules asked if Elaine knew anyone who would be willing to take on Mr Pickles, a 15-year-old cat who lived outside of Bracknell in Berkshire. Mr Pickles had semi-adopted Jules’s friends – Stacey and Julie – two years ago. Although he didn’t live with them on a permanent basis, they had an understanding. He would turn up for food, sit with them in the evenings, and he had even allowed them to take him to the, ahem, V.E.T. Mr Pickles and the couple’s young son had become firm friends and would cuddle up together on the sofa. Anyway, the family were emigrating to Australia and knew Mr Pickles, elderly gent that he was, probably wouldn’t survive the flight let alone the quarantine. They were desperate to find him a good home. They’d asked around the village but no-one knew where he’d come from. A few people suggested he lived in a shed, but none of them were willing to give him a home. Jules told all this to Elaine one Friday – Jules and Stacey were emigrating the following week! So Elaine set to work – with my help of course. I Tweeted and put it on my Facebook page. I also suggested she contact our lovely Cornish friends – David and Paula. These fabulous people have six lady cats! Turns out they were on holiday in Greece, but Paula answered E’s message and said her postman, Simon may take Mr P. She messaged him and he said yes straightaway. So The Plight of Mr P went from Bracknell to Surbiton to Greece to Cornwall in a matter of minutes! Elaine gave Jules Simon’s phone number and she passed it to her friends. They contacted him the very next day and on the Thursday, the day before he was due to emigrate, Jules’s friend Stacey set out at 6am and drove Mr Pickles to Redruth, Cornwall. Simon loves all animals, which is why Paula thought of him immediately. 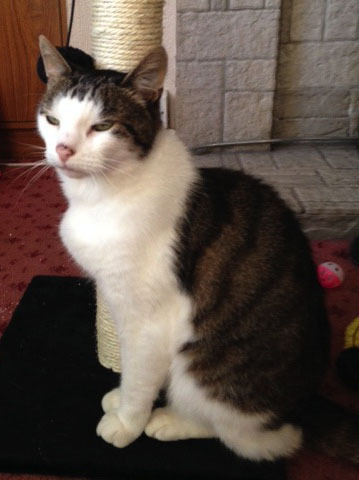 Simon had been semi-adopted by Doofus – a neighbour’s cat who used to come in for food and to sleep. Sadly he died suddenly not long ago at the young age of seven. Simon reports that Mr Pickles is settling in well after a week of staying in while he got used to his new surroundings. Simon has had him micro chipped and has put in a cat flap so he can come and go as he pleases. “He has realised this is his home now and seems quite content here,” says Simon. Ahhhh. I love a happy ending – don’t you? Huge thanks to Simon for having such a big heart and taking on this lovely elderly gentleman. And to Jules, her friends Julie and Stacey for doing the right thing by him, and of course to Paula for thinking of Simon. Elaine and Graham tell me Cornwall is very beautiful. They get all misty eyed when they talk about it so I’m sure Mr P’s twilight years will be very happy in such a wonderful place. 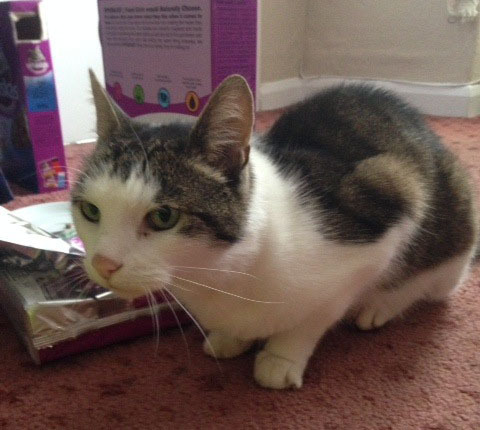 This entry was posted in Cat health and tagged heartwarming cat stories, re-homing cats on September 9, 2014 by MrMonty2014. Electrically powered Fuss and Feeding!